This little exchange of words gave me a new perspective when I exited the building. I left the confines of my work station feeling like I was entering the big wide world. I was free. I could find so many enjoyable things to do. It was my choice. While I appreciated that my co-worker helped me redirect my thoughts to the idea that I was free to enjoy the rest of my day, as I walked away I realized that I couldn’t do what I had promised her. I couldn’t enjoy the day FOR her. I could only enjoy the day for me. She could enjoy her day – even if she was stuck in her office. It was her choice. After we’ve been in a certain position at a certain company for a while, it can be easy to forget that we actually chose to be there. It can be easy to fall into a rut and take on the idea that you are chained to your desk for a certain number of hours a day with nothing really enjoyable happening in your life. The truth is, the only really enjoyable things are things that we choose to see as enjoyable. The next phone call you receive can be the most unwanted interruption or it could be the most delightful conversation you’ll have all week. The next task on your to-do list could be soul-sucking or it could be the thing that opens the door to more opportunities. Your desk can be your own little oasis or it can be a box-like prison. It’s not actually the activity, the location, the job, or the work that is enjoyable or not. It’s how you choose to look at it. 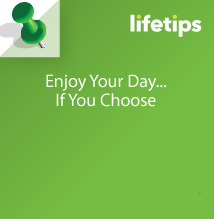 So whatever is on your agenda today, choose to enjoy the day for yourself. No one else can do it for you. Amy McGrath is a certified Frame of Mind Coach who helps sensitive professionals in a career depression experience the good stuff in life. She’s a strong believer that when you develop the ability to focus, you CAN have your cake and eat it too. You can reach Amy at amy@frameofmindcoaching.com.